The cough reflex is the body’s defense mechanism against mucus accumulation in the bronchial tubes. Cough is very common and is usually not serious. Coughs frequently accompany an ordinary cold. Are accompanied by high fever. Persist for more than seven days. Interfere significantly with sleep and daily activities. Are accompanied by difficulty in breathing. Any of the before mentioned symptoms should prompt an appointment during regular office hours except coughs accompanied by difficulty in breathing which require immediate care. At some time or another, every baby and child is going to catch cold. Colds are caused by viruses and are usually spread person-to-person from the infected nose or throat. Colds usually begin with a watery discharge from the nose accompanied by sneezing and watery eyes. The child can also develop fever, cough and a sore throat. Usually, the cough and sore throat are not particularly severe. The child may run fever for two or three days. As a cold progresses the nasal drainage often becomes thicker and may turn yellow or green. This may be the final stage in the resolution of a cold and no additional treatment is needed for several days if your child is otherwise doing well. So far, there is no cure for the common cold. Since the infection is due to a virus, antibiotics are not helpful. Treatment of colds is aimed at relieving symptoms and keeping the body well hydrated and nourished so that it can fight off the infection. Encourage plenty of fluids, especially clear liquids. This will keep the mucus thin and prevent dehydration. Encourage your child to eat nutritious foods. Use Acetaminophen (Tempra, Tylenol) for fever and/or aches (see Dosing Guide). Saline nose drops (AYR, Salinex, Ocean) are quite helpful when placed in the nose to loosen the mucus. You should put two or three drops in each nostril, wait a minute or so and then suction the nose with a nasal aspirator (bulb syringe) as often as needed. Saline nose drops are particularly helpful for very small children who are unable to blow their noses. Sometimes for older infants and children, nasal decongestants and cough/cold preparations can be helpful. If your child is less than 6 months of age, consult your doctor before using these. If the nasal drainage persists after the usual 7-10 days of a cold and seems to become thicker and greenish in color. If the cough becomes particularly severe and is associated with a high fever above 102 degrees F.
If your child seems to “keep a cold” year around, your child may be allergic and should be checked. 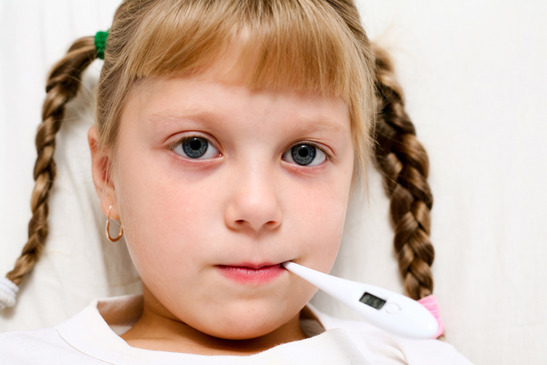 If your child’s temperature persists over 101 degrees F for more than three days. If your child’s sore throat is particularly severe. If your child develops ear pain. Do not start any left-over antibiotic prescriptions, as these drugs do not cure the common cold and can cause more harm than good.